If ever there was a dish that unites and divides us Indians it is the Biryani. Rarely in the history of mankind has dish, not native to the land, come in a made a place for itself in the heart of its people. We all know that biryani came to India courtesy the Mughals. Today, centuries after Mughals have long gone, the Biryani still continues to rules our hearts and palletes. I have often wondered what is so unique about this combination of rice and meat. The answer is simple. Across the length and breadth of this country, the biryani has integrated with the local flavours and suited tastes. You will not find a similar biryani anywhere in the country. So, while on one hand you have the gentler, more of meat, oil based ones in the north, Lucknow to be precise where it is known as the “Pakki (fully cooked) Biryani”. The cooking process here involves cooking the marinated meat and rice separately and then layering it together and cooking it on dum (steam). You then have the larger than life, biryani from Hyderabad where you would come across the “Kachchi (raw) Biryani”. Here, the rice (which is cooked al-dente) and meat are layered together and then given a dum. Move eastwards, towards Kolkatta and you will find the Kolkatta styled biryani, easy on the spice, generous helping of potatoes and with a lower proportion of meat. Here, the biryani will be more often than not be accompanied by the chap or rezaala. In, Mumbai, on the west coast you have the spicier variety with varying degrees of meat and rice to suit the Mumbai taste. The true test of a biryani is how the rice is cooked. It is essential to keep a hawk eye on the rice while it is being cooked. The usual method is to cook it till it is about three-fourths done and done while it cooks on dum, you have each grain proudly standing out, vying for attention and wanting to tell you a story. The meat is usually marinated in curds before cooking. This forms the perfect bite when you take in a morsel of rice, covered in the masala and then melt in the mouth meat. Truly, this is a moment that needs to be savoured. Usually, when there is talk of a biryani, the combination is usually that of rice and meat. You would not associate something as delicate as fish with such an elaborate method of cooking. 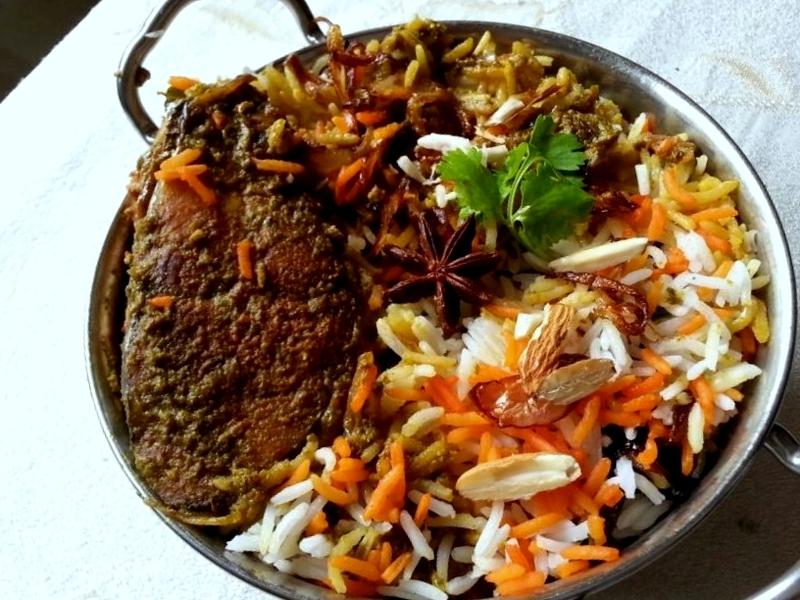 While I was discussing with a friend the other day the concept of a fish biryani, he joked that fish biryani would probably have been invented in a coastal area like Kerala or Goa. I so wanted to add Mangalore to the list, for obvious reasons you see. Some research and bit of experimentation, I finally cracked the code to a fish biryani; what I also managed to do was integrate into it some coastal flavors. Usually, curd is used to marinate the meat and as a base for the gravy. I substituted the curds with another coastal staple, coconut milk. The end result was a creamy and sturdier gravy. The coconut milk also helped balance the spice giving it a nice even taste. Another change I made was not marinating but gently frying the fish. That helps to give the fish a slightly firmer texture that helped when cooking the fish in the gravy. In all earnest, which ever biryani works for you, the best thing to do is go through the entire process of cooking the biryani, whilst doing so savour the aroma and once done, dig in and enjoy a meal fit for royalty. A pinch of orange food colouring mixed with 20 ml water or milk. Wash the fish and pat it dry. Add the lime juice, salt, red chilli powder and turmeric powder to the fish and rub well. Keep aside for an hour or so. Now, heat oil in a pan and fry the marinated fish for about 3 minutes a side. You don't need to entirely cook the dish at this stage. Once done, remove and drain on absorbent paper and keep aside. Heat 4 cups of water in a large vessel and bring to a boil. Tie the whole masala in a small muslin cloth and drop in the boiling water. Soak the rice in water for about 15 minutes. Then wash under running water till the water runs clear. Heat oil in sufficiently large frying pan on medium heat. Add the sliced onions and give it a mix so that the oil covers the onions well. Add the salt. Cook on medium heat for about 15 minutes till the onions turn reddish brown in colour. Take out from the heat and cover and drain on an absorbent paper. In a large vessel, heat the oil and add the whole spices, curry leaves and allow them to splutter. When the spices begin spluttering and releasing aroma, add the chopped onions and let them cook till they turn golden brown. Add the ginger, garlic pastes along with the chillies. At this point add half the onions that we had fried. We will retain the other half for garnishing. Once the onions are done, add the chopped tomato and cook till the tomatoes are mushy and limp. Add the green paste along with very little water. Saute this on a medium flame till the oil begins to leave the sides. Lower the heat and add the coconut milk and mix well. Once the mixture has integrated well add the spice powders. Mix well. Add the fish, and stir gently so that we don't break the fish fillets/ pieces. Once done, add the chopped corriander and mint leaves. Line a large vessel with ghee/ oil. Add the gravy mixture. Now add in one half of the onions we had fried earlier and some of the fried cashews, almonds and raisins. Layer the gravy mixture with the cooked rice. Sprinkle the surface with the rice that was mixed with food colouring. Finish the layering with the remaining fried onions and dried fruits. Cover the vessel with a lid that fits perfectly. Or you could cover with aluminium foil so that no steam escapes. Place the vessel on a tawa and cook for 30-40 minutes on a medium flame. Allow it to rest for about 10 minutes after you've turned off the gas.